Just like how one must eat street food in Taiwan’s night markets, street food is also a must-try in Korea. I mostly eat them in Myeongdong, where food stalls start lining the streets at around 6PM. I’ve heard that Myeongdong doesn’t offer the best prices for street food in Korea because they are targeted at tourists, but the prices are still within reason and the food is undoubtedly delicious. UPDATE: I finally found street food that I didn’t like. Oh well. Everyone knows that tteokbokki is a must-eat in Korea, but have you tried tteokbokki with baked cheese on a skewer? I love both ingredients, but the cheese is what really makes this a clear winner in my list of street food to recommend. It’s slightly oily, probably fattening, but absolutely delicious. I’ve only eaten this in Myeongdong. I think there are a few stalls selling this, but the standard price here is 3000 won. This tastes even better in winter when you’re dying from the cold – take my word for it! I love potatoes, so this definitely tops my list. The top 3 photos are from Myeongdong, and the bottom one at Jeju’s Seongsan Ilchubong Sunrise Peak. They taste pretty good no matter which stall I buy them from, but I’m hoping to try some other seasonings in future because I always bought the cheese-seasoned ones. They remind me of potato chips, except a lot chewier. UPDATE: I finally tried the onion-seasoned one in Myeongdong. Tasted just like potato chips. Absolutely delicious. I only remember that I bought the one in Myeongdong for 3000 won, not really sure about the one in Jeju. However, this is a must-try if you’re in Korea, so do make sure that you give it a go even if you’re not a fan of potatoes! UPDATE: I found one in Myeongdong that costs 4000 won: it comes dipped in onion/cheese powder! Super good! I bought this 1500 won in Myeongdong, but I’ve heard that this goes for just 1000 won in Sinchon, so keep an eye out for it in other areas as well! The muffin is quite ordinary, but the soft, fluffy egg is what truly made this special. I would eat this for breakfast everyday if I could. UPDATE: When I went to Korea in Dec 2017, all the prices went up to 2000 won in Myeongdong! 😦 it’s hard to believe that they all hiked up the price by 500 won in just a short span of 4 months, but I can honestly vouch that they are just as delicious. UPDATE 2: They have variations with pumpkin seeds now! Everyone knows to eat fried chicken in Korea, and the best part is being able to shop and eat this delicacy on the go. My favourite seasoning is spicy honey sauce, and topped with chewy tteokbokki that you can’t stop chewing on. This is also extremely filling, and could literally be enough for one meal. I bought this for 5000 won in Myeongdong – slightly pricey, but the chicken was absolutely worth it. UPDATE: I finally got around to eating the ones sold from a Myeongdong street vendor. It was not a great idea to not eat on the spot since it was winter because our mandu was cold and soggy by the time we reached our hotel. Unfortunately, I don’t have a close-up photo of this because I got too excited and ate it without taking a proper photo last December. But, look at that egg! Most of the time, however, I could only remember tasting the egg and the cabbage, with hardly any meat. The piping heat from the pancake is really comforting in winter, however, so I highly recommend eating this in winter instead of summer. These are deep fried chunky sweet potatoes are coated with caramelized sugar – so sinful, right? Word of caution: best eaten when hot. You really don’t want to eat it when it’s all cold and soggy. 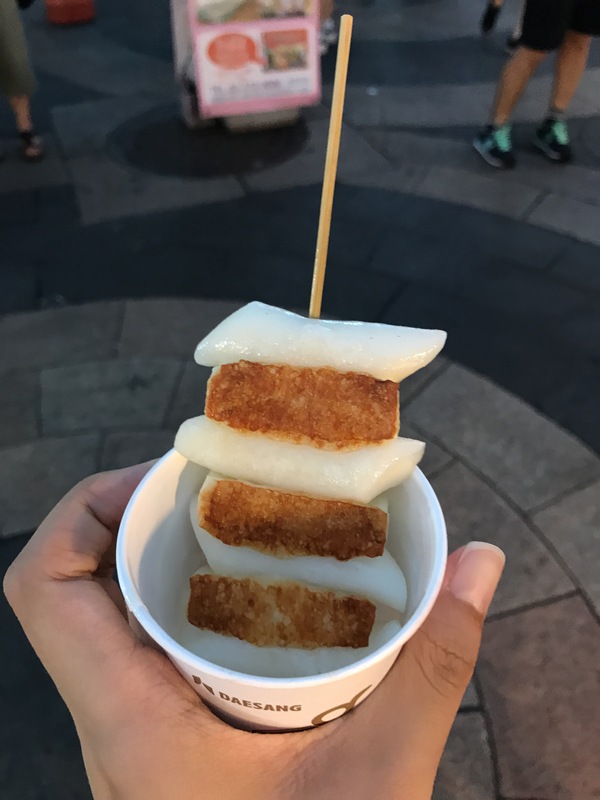 You will find stores that don’t just purely sell eomuk, but also other ingredients like hotdogs, sausages, and crabmeat rolls in fried beancurd skin. Not a bad snack to have on a cold winter night! Don’t neglect the kimbap while you are busy munching on other street food! This stalls sell 5 for 5000 won, and you get to choose what fillings you want. I personally recommend the cheese ones, although most people would probably tell you to pick the spam (basically luncheon meat) one. Korean strawberries are the BEST, so you definitely got to try this one out. The Japanese mochi is stuffed with one whole juicy strawberry and red bean paste, which makes for a very sweet and delightful treat. Usual price is 1500 won. You’ll find quite a few Japanese dishes sold on the streets, most of which I’ve seen are yaki udon and takoyaki. Frankly, the portions are not as good as I liked, and are a far cry from a satisfyingly full meal. However, if you think of it as a snack to complement the other snacks that you’re most likely (actually definitely) buying from other stalls, it becomes understandable why they serve small portions. The price though… I’m not sure I would want to pay 4000 won for such a small bowl again. I love scallops. I love cheese. I love butter. This should have been a fantastic combo. However, I’m slightly disappointed by this because it doesn’t taste quite as good as I imagined it to be. There aren’t as many scallops as I would have expected from paying 10 000 won. I’ve only seen this selling in Incheon’s Chinatown, so I’m not sure if other places sell this! Frankly it’s not that bad, but the frozen sugar syrup is so hard that no matter how much I lick and try to bite, I still can’t get to the fruits. I had to resort to dipping this in hot water to melt a bit of the syrup – it’s just too much effort. So glad to have found this post, I am going to try all of the ones you recommended, maybe even the ‘Meh’ ones haha. I am not a big fan of Udon on any given day, so would be happy to skip. Really want to try the candied fried potatoes. Wow I wish I found this before I went to South Korea a few months ago! This food looks so good and I like that you included some things to avoid too. It’s so hard to know what’s good and what isn’t when traveling somewhere with a completely different culture!